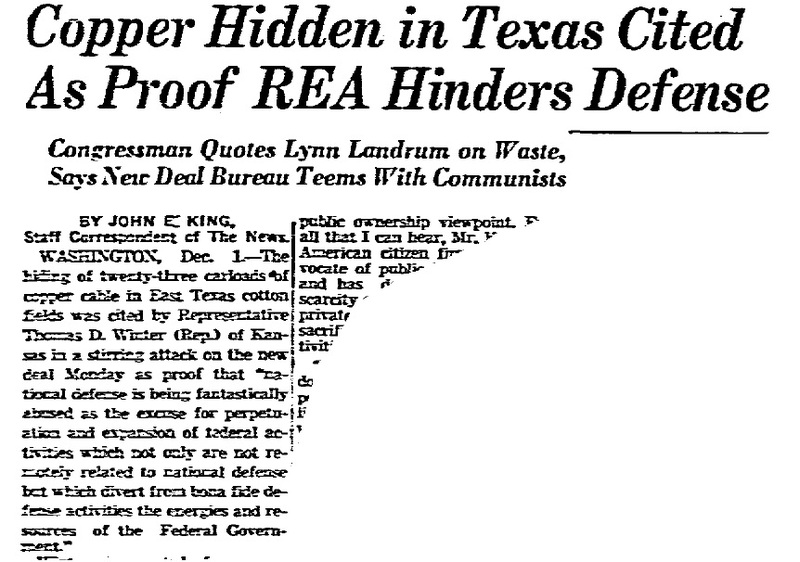 ID: 762 ~ Source: John E. King, “Copper Hidden in Texas Cited as Proof REA Hinders Defense” Dallas Morning News, December 2, 1941. This article reported in detail Congressman Thomas D. Winter's attack on the REA over copper supplies stored near Gilmer, Texas for use by URECC and other members of a generating cooperative. It reports Winter as saying, "I say to you that the Gilmer copper steal is merely an example of the chicanery and political connivance that would be exposed by an honest and thorough investigation of the Rural Electrification Administration."